Our Giant Snakehead fishing holidays at Srinakarin Dam in Thailand offer visiting anglers the chance to fish for Giant Snakehead against a back drop of the amazing scenery of Srinakarin Dam in Kanchanaburi province. Anglers fishing at Srinakarin Dam in Kanchanaburi province in Thailand will be picked up by a Fishsiam representative at Bangkok airport or their hotel and transported to Srinakarin Dam. After travelling through rich rural pastures and fertile agricultural districts the anglers will arrive at Srinikarin Dam located in Khaoen Srinikarin National Park in Central Thailand. Khaoen Srinakarin National Park is an extremely atmospheric fishing location affording the anglers magnificent mountains views and limestone karst scenery. The banks of Srinakarin Dam are a haven to a myriad of wildlife, flora and fauna making it a truly magical fishing location.The lake offers large areas of deep open water making it a fishing mecca for Giant Snakehead, Sheathfish and Wallagu species. On arrival at Srinakarin Dam anglers will dine on a light lunch before being equipped with Spinning Rod, Reel, Leaders and lures. Anglers fishing for snakeheads at Srinakarin Dam in Thailand will have the exclusive use of a traditional longtail boat captained by a local boatman and a Fishsiam guide who will be in attendance throughout your fishing trip. Anglers will be transported to remote areas of the dam in search of Giant Snakehead and various other native predatory species casting their lures near to submerged trees and other natural underwater structure. 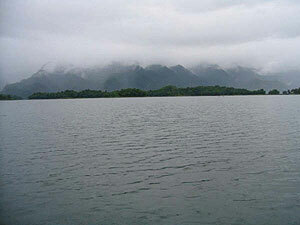 A vast reservoir such as Srinakarin Dam requires the angler to adopt a roving approach fishing various parts of the lake in order to search out the elusive Snakehead. After Snakehead fishing until dusk the angler(s) will be transported back to floating fishing bungalows stationed on the banks of the lake for dinner and basic overnight accommodation. Anglers will commence fishing at 5.30-6.00a.m. 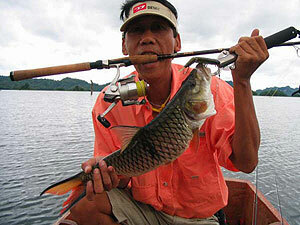 With your Fishsiam guide and local boatman and continue to explore the reservoir. Anglers will fish until 11.00a.m. Before returning to the floating raft around noon for a light lunch. Fishing will resume again from 2.30-3.00p.m throughout the afternoon until dusk. At the end of your days Thailand snakehead fishing anglers will return to the onsite floating bungalows for dinner and overnight stay. Srinakarin Dam Thailand Fishing will start 5.30-6.00a.m with your Fishsiam guide and local boatman continuing to explore the reservoir. Anglers will fish until 11.00a.m. Before returning to the floating bungalows around noon for a light lunch.After a few more hours Snakehead fishing anglers will be picked up by an air conditioned vehicle at 3.00p.m. Before returning back to Bangkok. Srinakarin Dam in Thailand responds well to various techniques including lure fishing, bait casting and fly fishing tactics and is suited to experienced lure fishermen with a sense of adventure and love of nature. It is advised that anglers wear long sleeve shirts and caps to allow some protection from the sun and bring wet weather clothing during the wet season. Our team of highly experienced Snakehead fishing guides and boatmen have excellent local knowledge giving the angler the highest possibility of success.With the wild and vast nature of the venue and the constantly changing fishing conditions it is recommended that you contact us with regards to the best times to visit this venue.Tours to Srinakarin Dam fishing for Giant Snakehead are designed exclusively for 2 anglers per trip. Larger groups can be accommodated, booking is required to be completed 1 month in advance (larger groups). Our Thailand snakehead fishing holidays at this venue can be combined with other locations on our packages page to cater for the discerning anglers specific angling itinerary.